Some of you may recall the image of Thomo suspended on high and being lowered to the ground by a delightful young lady a third of his weight. I did. I therefore decided that I would do something about it. 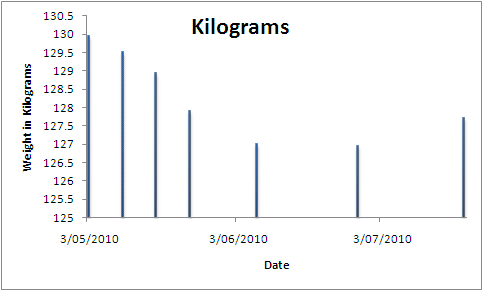 I’d noticed that my weight had not really changed all that much over the past couple of years – well, there was a loss of weight in the periods I lived and worked in Korea and Mongolia and an increase in the time I was in Saudi Arabia but overall it had remained the same within a range of a few kilograms. This suggested to me that my daily intact of nutrient (cheeseburgers, pavlovas and the odd meat pie washed down with beer being the preferred nutrients) was about equal to my daily expenditure of energy, at least proving to some that I did not necessarily just sit on my fat ding all day. What I therefore needed was a way to expend some more energy and perhaps, at the same time, a slight change to my eating habits. I joined a gym and targeted to spend at least three days of each week doing a little exercise. Periodic weigh-ins have indicated to me that this is having some effect and in the direction I wish to go, although the last couple of weeks indicated a retro step. So, I will continue this process – exercise and more careful eating, maintaining my Subway addiction. “What’s your target?” I hear you ask. Overweight. That is my first target – to just become overweight. Then I’ll sit and assess my next target at that time – oh, and maybe consider a trip back to Singapore to see if I can get myself hung-up again!